I'm slowly, slowly getting myself back to normal. I've spent this past week eating well (not "dieting", bah! ), taking my supplements, drinking my water and working on getting enough sleep. I've been busy, but have also made a point of fitting in some relaxation time. I've logged calories, but haven't been weighing myself at all. I've had a couple of drinks (but don't plan on repeating Monday's awful hangover - blah! ), and last night enjoyed some lovely chocolate. Restriction and deprivation simply aren't on the menu. Training hasn't really featured - a couple of walks, a bit of outdoor work with a client, but that's it. I know from past experience that when I try to go from zero to 100% in no time at all, I'm likely to crash and burn, so I've been working on things gradually. Right here, right now, I'm feeling more relaxed and more balanced than I've felt in a long time. I woke up this morning to bright sunshine, and thanks to some clients on holidays or rescheduling sessions this week, I only have one booked this morning. That one happens to be at the gym, so I'm thinking some kind of workout is in order for me afterwards. I'll wait and see what I feel like doing when I get there - at this point, I have no idea. Next week, I'll be back to training, but I will be doing only what I enjoy. The fastest way to send myself off-track is to schedule in exercise that I loathe.... Good thing there are plenty of things I like. LOL. This morning as I walked into the bathroom, I decided that I'd like to know where my weight's at. I've looked at the scales several times over the past weeks, but have had no desire to step on them. There was no trepidation, only curiosity, and the news was no surprise: today I'm sitting at a slightly heavy 60.3kg. That's probably a good 2kg less than I was a week ago.... and the funny thing is that I look nothing like I did at that same weight a couple of years ago. Not quite as lean as I'd like, but nothing to get worked up about. At the moment, my main goal is to get myself back to what passes for normal. I'm employing someone to help me with that too, since I'm clearly useless at figuring out what the hell is going on in the darkest corners of my mind. I'm sure there will be more bad days in store in the coming weeks, but I'm quietly confident that everything is going to be alright in the end. Great work Kerryn.. glad to hear you're feeling better..
That's awesome! Anyway your weight puts you smack bang at the 'normal' weight for your height so, what's the problem? I'm sure you look fab anyway, it's a matter of personal style, and you have that at any size. 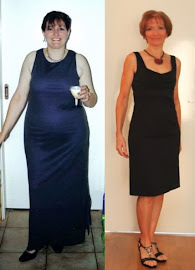 good news kerryn- great to see you back on track and not beating yourself up! Enjoy the weekend- the weather looks fabulous!!! That sounds more like it, finally. Amazing how some decent weather can make a difference. Frick. It's raining again. Only across the northern suburbs though apparantly. Lucky us.